Shortly after introducing table food we recommend introducing a cup with water. While giving children an open cup is ideal, it’s simply not practical for most situations. Most families choose to use a sippy cup that cannot spill for convenience. Many different brands of sippy cups are available. Usually a cup with a soft plastic top and two handles makes the transition smoothest. If children are not taking to their cup, you may try a different brand. Offering a cup is not typically as challenging as a bottle. Your little one will most likely be interested in the cup and figuring out how it works. If they seem uninterested, try a different cup and see if they like it better. The more familiar children are with a cup the easier the transition off of the bottle will be. We recommend using cups for anything other than breast milk and formula. Only breastmilk or formula in a bottle and everything else in a cup. 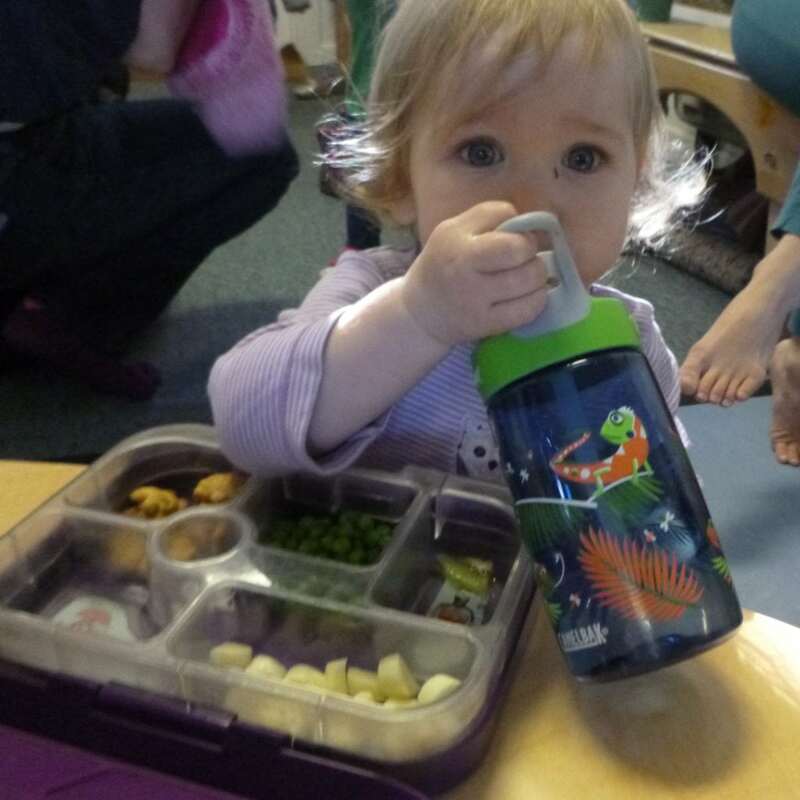 In is healthy for mobile infants to regular access to water a sippy cup. When you are ready to introduce milk that is not breast milk or formula, you can make the natural transition off the bottle. We do not recommend juice for children. Juice is not a necessary part of a healthy diet. Children that become accustomed to drinking water will be able to choose water as a long term healthy drink choice. Remember, as you’re introducing food and drink, your goal is long term healthy choices. If you choose to introduce any juice, we recommend diluted 100% fruit juice as a sometimes food (more about sometimes food later). Most children will stop taking bottles at about one year of age. Many families still give bottles in the morning or at night until 14-16 months of age but the longer you wait the harder weaning will be. Children that are still breastfeeding can still stop using a bottle. You can offer expressed breast milk in a cup. Formula is not recommended for children over one. After one children can get all the nutrition they need from food, though many pediatricians recommend a small amount of whole milk or breastmilk in addition to food. You determine when it is time to say goodbye to the bottle. Be clear and honest with children. If you have prepared as outlined above they will adjust. Around one year of age children can begin asserting their own ideas and plans so we recommend talking with your child about their bottle. Tell them your plan. Just say honestly, “As you are growing, you are going to learn to drink from a cup. Would you like to pick the blue cup or the green cup for your milk?” Often offering two acceptable choices will help children participate willingly in the change.